It’s finally come to this…Confession! Yes, this One Bloggers Confessions. I’ve been journaling for probably 30 years, it’s one of the ways that I stay close to God. I pour out my heart to Him and He speaks to my heart and I write it down…so I don’t forget what He spoke to my heart years ago. HA! I’ve been blogging now for 4 years and over the years there have been many, many, many times that I have come to God with many different issues about blogging. From self centeredness, striving, dishonestly, gossip…well you name it. Whether I’ve had to avoid these things or been a part of it…I’ll tell it all. You see, I want to be the same Shari on my blog as I am off of my blog. The thing is that God sees me for me. Whether I blog or not…so why try to be something I’m not, as I am first and foremost accountable to Him. In these 4 years of blogging, I’ve had to bow before the Lord and pour out my heart to Him. I thought it might be helpful to other bloggers to let you into my heart, my secret journal, my bloggers confessions. I’ve been striving! Today in my quiet time…The Lord was gracious to speak to my heart and whisper… “Cease striving Shari.” I got your back, it’s under control, give it up…. well you get the picture. There are so many things that we can strive for when it comes to blogging! Dedicated Readers ~ We want peeps to come back, right!? The perfect design~ Ok I’ve had this design for a month and now I see something that looks WAY better. Education ~ I have got to learn every single thing there is about Blogging, the internet, SM therefore sometimes spending too much money and time. Need to find out the best way to everywhere at once without really being there. Of course you know as well as I do there are tons more things we can strive about, these are just a sampling. Feel free to print out for yourself. Ouch! There is a fine line between striving to make money and exalting God at the same time. Oh it’s ok to make money…I just never want it to be my sole focus. 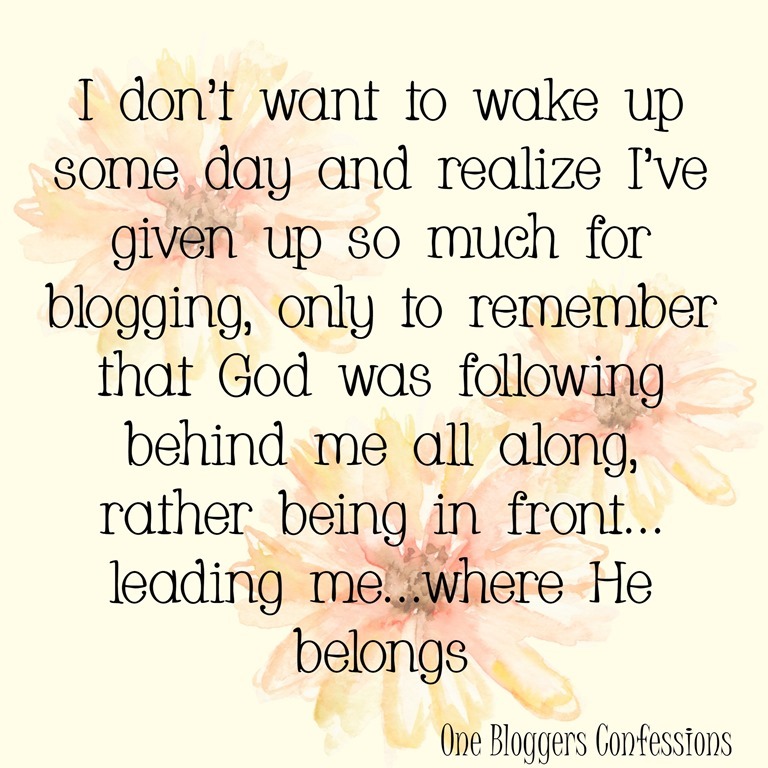 I don’t want to wake up some day and realize I’ve given up so much for blogging, only to remember that God was following behind me all along, rather being in front… leading me…where He belongs. My striving has stemmed from needing to make some extra money due to the fact that I am not watching my Grandkids anymore.. equals less income. So I’ve taken on WAY to many things in order to make up my income difference. This has caused me to have a striving spirit…and I’m exhausted. Thank you so much for this honest, heartfelt post, Shari! It is such an encouragement to know that we all struggle with the same thing. May we all cease to stop striving but rather to honor God in all that we do. It is so easy to get caught up in the work we forget our true goals, our primary reason for being! Thank you for posting this! I enjoyed this post very much and really made me stop . . . .and think. Thank you for sharing on the Brag About It link party! God in front instead of behind…great reminder! Thank you for sharing this inspirational post on The Wonderful Wednesday Blog Hop, Shari-and for helping me to remember what is truly important in life. God Bless. Man, this could not have come at a better time for me. I struggle with so much of this post. I am new to the blogging world (one month exactly) and I have talked to God about this so many times. I didn’t think it would take so much out of me. Trying to find a balance while not getting sucked into all the popularity contest I feel like it is sometimes. Oh, so much . . . thanks for being real. This has been on my heart for a while now. I am frequently reassessing and reprioritizing because somehow I let blogging get ahead of God. Thank you for blessing me with these words this morning. I pinned this post to my Deliberate FAITH board. I use to have a journal. This has so inspired me to get back to my journal writing. I have missed my journal writing and the time spent talking to God. What a great post. We all work so hard to be the best and make the most. I am glad you took the time to be honest. Thanks for linking this to the This Is How We Roll Link Party! Love, love what you wrote here! ♥ I have often had to remind myself to display the same character I am in my blogs, FB, etc to those I interact with everyday. I love the change that has come over me in the last few years since participating in the various social media networks, and receiving the encouragement and friends I have made along the way. Blessings for a weekend of joy! I feel like you were sitting in my prayer time this morning. The Lord and I talked about this very thing. I’m praying to do what I am able and let Him do what He wills. BTW – You are the same Shari in person. Love you! Blessings and hugs! This is so good, and so true. Thank you for being honest. I think a lot of people hear “blogging” and they have no idea the time and effort that goes into it. But, you’re right – if our goals aren’t ultimately Gospel worthy, what are we striving for? There was a time back in 2013 that my blog sat silent….for months. I knew that I wasn’t doing what the Lord wanted me to do with it, so I just stopped. Thankfully He put a new desire in my heart and STC is what it is today, but I’m constantly reevaluating and striving to make sure that what we’re doing is pleasing to Him. Thanks for sharing at Grace & Truth! I hope you’ll join us again this week. Thank you for sharing this heartfelt post with us at Merry Monday! Thanks for sharing this on the Art of Home-Making Mondays! I think many of us have the same battles! It’s woneurfdl to have you on our side, haha!